How to recover lost iPhone call history? How to recover lost iPhone call history? How to get missing iPhone call records back? How to restore vanished call logs from iPhone? I deleted my call history by an accident and there were numbers I didn't have saved. Now I need them urgently! Where can I see my call history? Please help! Any help would be appreciated! Call history is an important part of your daily mobile use. All types of call details can be checked through this option. But, sometimes call history can be lost from your iPhone due to some reasons like accidental deletion, a failed system upgrade, virus attack, etc. This can be a big headache for you. With a previous backup file can help to recover lost iPhone call history, however, if you don’t have any backup, how to get missing iPhone call records back? Here we will introduce you with iFonebox. It can help you deal with as many as 17 file types like contacts, notes, text messages, photos, voice memos, videos, safari bookmarks, reminders, calendar events, WeChat data, WhatsApp data and many more. It has two available versions: Windows version and Mac version, please make sure to download and install the correct version for your computer. 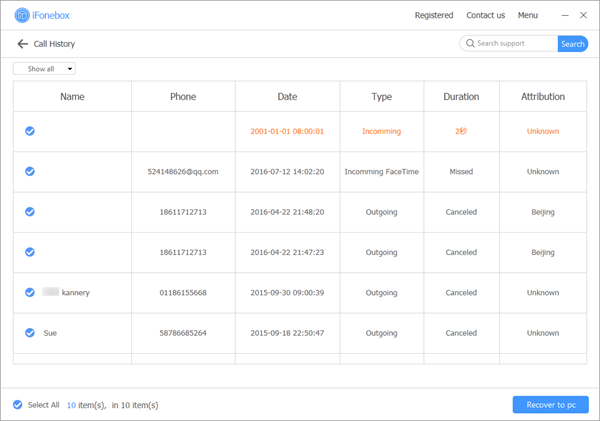 Then you can follow the next steps to restore vanished call logs from iPhone. Take tests for example, it will scan automatically after you click the “Call History” icon, the duration depends on the amount of your data so it might take your some time, please wait patiently.